How do we know the river Sidon runs south to north? Answer 1. Is there a name correlation between the Old World name Sidon and either the Usumacinta River or the Grijalva River? Answer 2. Richard Hauck proposes in his writings that Coban, Guatemala, is Manti where the headwaters of the Sidon began. However, neither the Usumacinta River nor the Grijalva River runs by Hauck's candidate for Manti. Why? Answer 3. 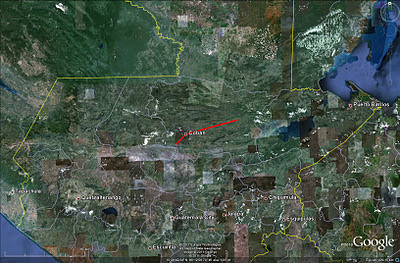 Proponents of the Grijalva River point out that the wilderness of Hermounts is between the Uxpanapa and the Chimalapa regions of the Tehuantepec wilderness, which is west and north of the central depression of Chiapas (the Grijalva River) as required by the Book of Mormon. They also point out a name connection with Hermounts and Tehuantepec Answer 2. 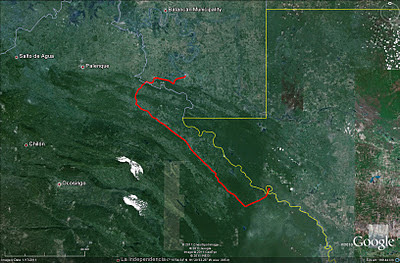 Where is the proposed wilderness of Hermounts located by adherents of the Usumacinta River? Answer 4. Alma crossed over the river Sidon and traveled east to the valley of Gideon. Later, he crossed over the river Sidon and traveled west to the land of Melek. The Allens (Dr. Joseph L. and his son, Blake J.) 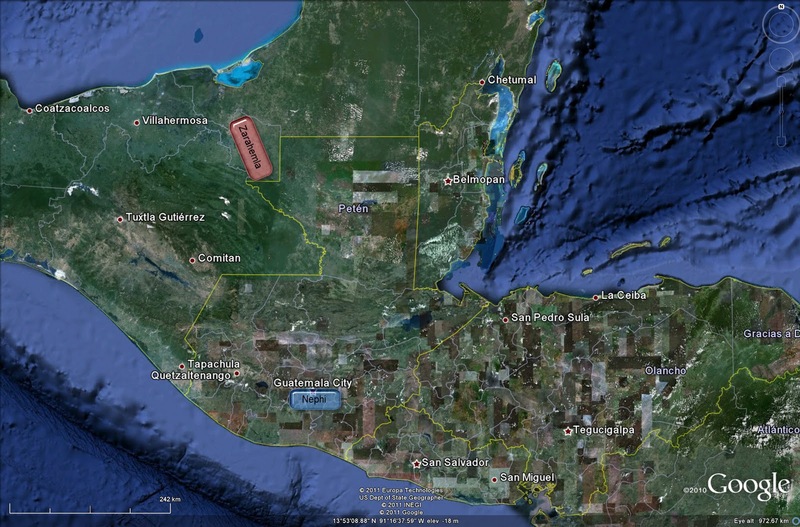 have proposed the Comitan region as the valley of Gideon and the Tonala region as Melek. 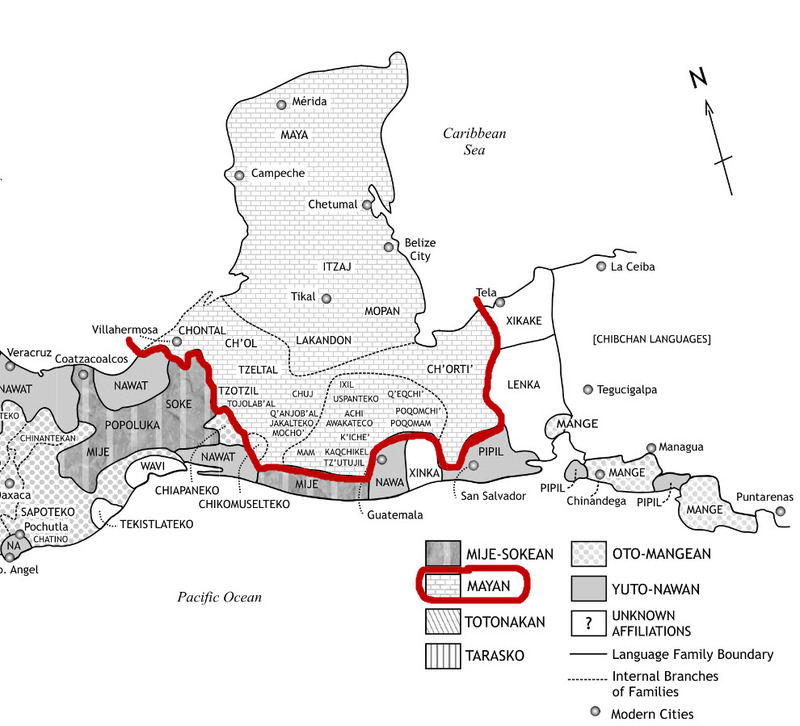 Where do adherents of the Usumacinta River place Gideon and Melek? For Gideon, see Answer 5a. For Melek, see Answer 5b. Dr. Bruce Warren spent nine years working with the New World Archaeological Foundation, primarily in the Chiapas valley. He identified pottery similarities with the upper Grijalva and the highlands of Guatemala. 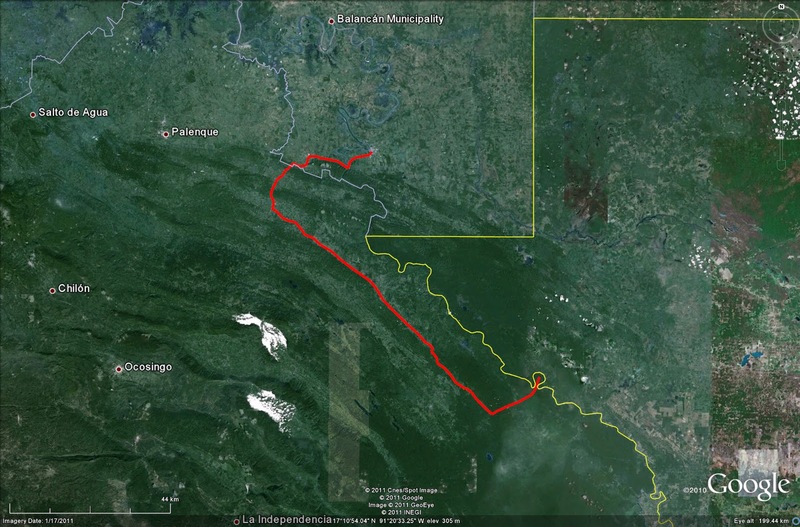 Has the same pottery connection been discovered along the Usumacinta? Answer 6. Fun for Less takes tours along the Usumacinta River, proclaiming that Yaxchilan may be the city of Zarahemla. The Allens write in Exploring the Lands of the Book of Mormon that "No Nephite ever lived at Yaxchilan." Who is right? Why? Answer 7. Jerry Ainsworth accuses the Allens of not being current in their research in analyzing the river Sidon. Response? Jerry Ainsworth states that the city of Zarahemla was not built along the banks of the river Sidon. Any comments? Joe Anderson challenges the Allens on the migration route from Nephi to Zarahemla, stating that the distance from Kaminaljuyu to Chiapas is too great. Any comments? Answer 10a & Answer 10b (see point #24), both of which are based on the rule of thumb metric determined in Answer 10c. It appears that Dr. John Sorenson, Dr. Bruce Warren, and Dr. Joseph Allen are all in agreement that the Grijalva River is a better candidate for the Sidon than the Usumacinta. What is the primary driving force among some other scholars in stipulating the Usumacinta as the Sidon? Answer 11. The Allens propose a name correlation with the city Sidom along the Grijalva Answer 2. 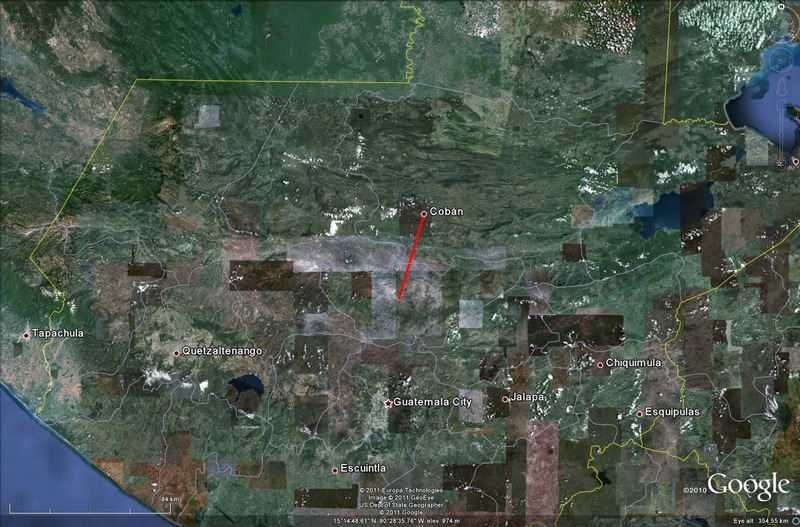 Where do adherents of the Usumacinta place the city of Sidom? Answer 12. 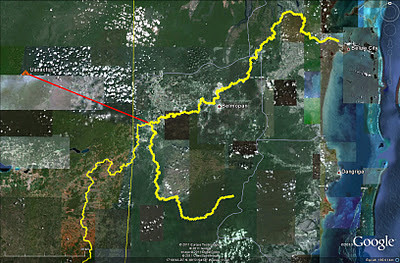 What is the relationship with the Jaredite land southward (wilderness of wild animals) and the two rivers under question? Where did the sons of Helaman fight in defending the west sea, south? Answer 14. What is the relationship between the narrow neck of land and the river Sidon? Answer 15. What is the relationship between the narrow strip of wilderness and the river Sidon? Answer 16. Preclassic battles along the Sidon suggest numerous Nephite population centers in close proximity to the Sidon. 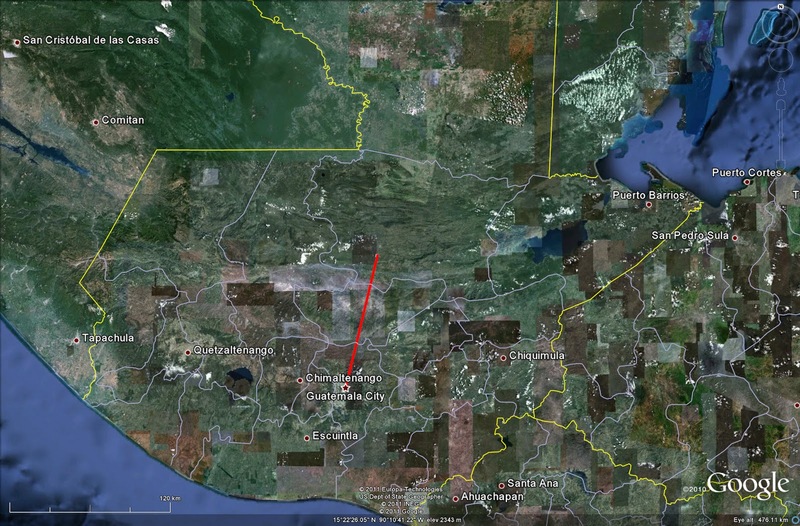 Why are such Preclassic population centers not found in close proximity to the Usumacinta River? To what extent are they found in close proximity to the Grijalva? The city of Zarahemla was probably in close proximity to the river Sidon. 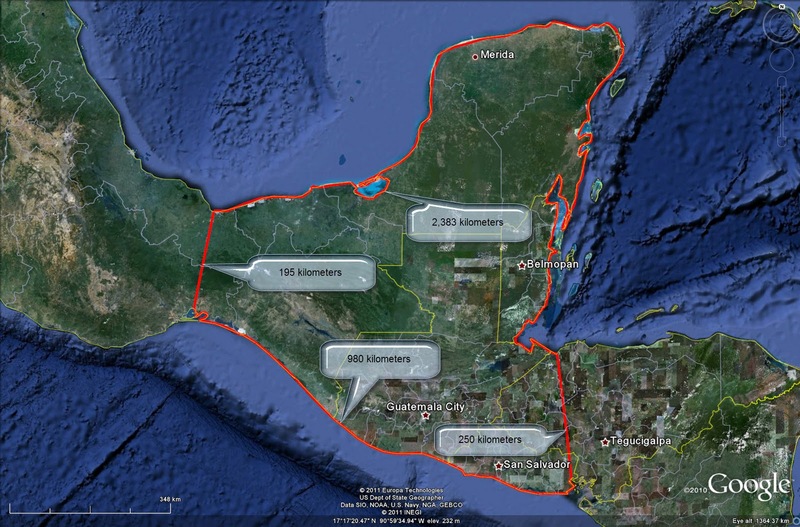 Why have no credible sites that satisfy criteria for the Preclassic city of Zarahemla been found in close proximity to the Usumacinta? To get to the city of Zarahemla, the Limhi expedition probably expected to locate the head of the Sidon and then follow the Sidon to the city of Zarahemla. Had they located the Sidon correctly and followed it to the Preclassic city of Zarahemla, they would have encountered thousands of people who spoke their same language, who called themselves "Nephites," and who could have clarified all issues about the city and the land of Zarahemla. 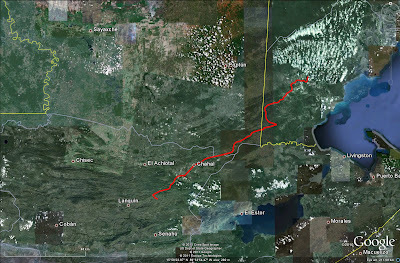 With these facts in mind, why should anyone conclude that the Limhi expedition traveled along the Grijalva rather than the Usumacinta? 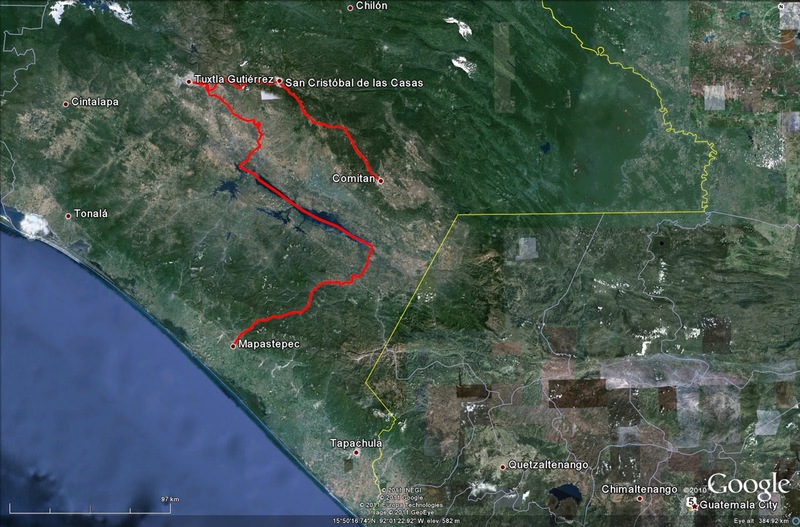 Why did the New World Archaeological Foundation (NWAF) select the central depression of Chiapas rather than territory along the Usumacinta River as the primary location for most of its archaeological endeavors? Why doesn't the NWAF "come clean" in admitting its biases in favor of the Grijalva rather than the Usumacinta as the preferred candidate for the river Sidon? To what extent does the archaeological research of the NWAF support the central depression of Chiapas as the heart of the land of Zarahemla and the Grijalva River as the river Sidon? During the Preclassic Period, dozens of villages and cities were located in relatively close proximity to the Grijalva River in the central depression of Chiapas. Why do proponents of the Usumacinta River as the river Sidon tend to overlook these Chiapas villages and cities in their model for Book of Mormon geography? How do Usumacinta proponents explain the extensive Preclassic sites in the central depression of Chiapas? 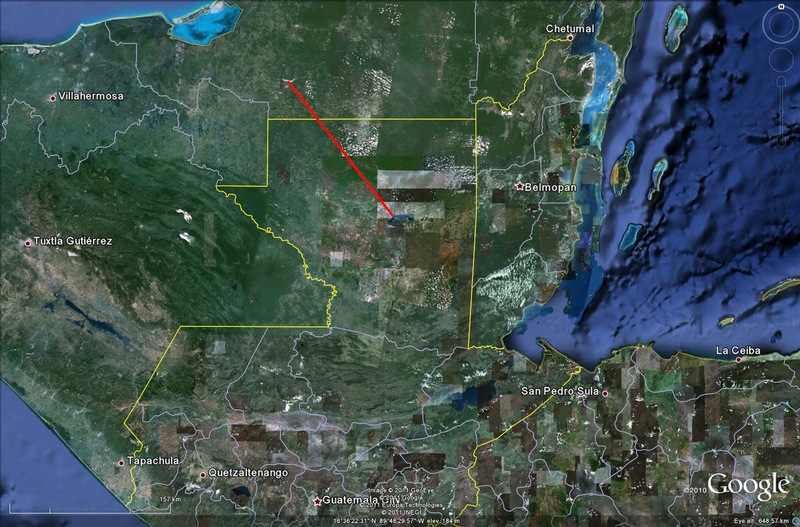 Why are not the remains of comparable Preclassic villages and cities found in close proximity to the Usumacinta? The process of transmitting The Book of Mormon from the original authors/engravers to modern readers has been long and complex. The following summarizes key points in the textual history of the 1981 English LDS edition. RLDS (modern Community of Christ) editions have different printing histories. Nephi, Jacob, Alma, Mormon, Moroni (and others) engraved their words on metal plates. Mormon and his son, Moroni collected, copied, and condensed many original source documents into our current text. Joseph Smith, Jr. with divine help verbally translated the ancient engravings into King James (Elizabethan) English. Oliver Cowdery (and others) wrote Joseph's words on paper (original manuscript which is 28% extant). Oliver Cowdery copied the original manuscript to the printer's manuscript which is essentially 100% extant. E.B. Grandin and his employees (primarily John Gilbert) added punctuation and set the type for the 1830 Palmyra edition, largely from the printer's manuscript, but partly from the original manuscript. Because of corrections made during the various press runs and variations in collating printed signatures for binding, not all original 1830 edition copies are identical. Joseph Smith, Jr. (and others) made some changes from the 1830 edition as they printed the 1837 Kirtland and the 1840 Nauvoo editions based on the original and printer's manuscripts. Orson Pratt introduced more changes along with the modern LDS chapter and verse structure in the 1879 edition. James E. Talmage introduced additional changes in the 1920 edition. The current 1981 edition was an attempt to harmonize the various previous editions in light of what textual scholars then knew about the original and printer's manuscripts. The bottom line is there are many variants of and some known errors in The Book of Mormon text, and before one puts too much faith in the wording of a particular passage, the careful student will consult Dr. Royal Skousen's 6 volume, 4,060 page critical text or his more accessible 2009 Yale University Press edition (848 pages) of the text. Dr. Royal Skousen's 6 volume Analysis of Textual Variants of the Book of Mormon in red. The 3 blue volumes are his studies of the original and printer's manuscripts. Photo by Kirk Magleby, October 2011. Even Mormon had trouble keeping everything straight in his mind all the time. In Alma 53:3 he engraved "the land," then corrected himself and because one can't erase engravings on metal plates, said "or, the city, Bountiful." As verse 4 makes explicit, it was the city and not the entire land that was fortified. Mormon had previously temporarily confused the lands of Bountiful and Moroni Alma 50:32. The same thing happened in Alma 56:14 where Mormon engraved "the land of Manti," then corrected himself and said "or the city of Manti." As verses 13 & 15 make explicit, Helaman I recorded a list of cities in his epistle to Captain Moroni. Alma 53:6 says that the city of Mulek was in the land of Nephi. That is simply not true. The city of Mulek was in the greater land of Zarahemla north of the narrow strip of wilderness. It was temporarily controlled by a Lamanite invasion force, but it was clearly located in traditional Nephite territory. Royal Skousen's critical text corrects this obvious error to read "the city Mulek which was one of the strongest holds of the Lamanites in the land of the Nephites." Alma 51:26 says that the Lamanites under Amalickiah took posession of the city of Nephihah. That directly contradicts the previous verse and disagrees with the phrase in verse 26 that the named cities were all on the coast. It also contradicts Alma 59:5-11 that describes Nephihah's fall. The critical text corrects this error by replacing "Nephihah" with "Moroni" which was definitely the southernmost Nephite city along the east sea coast. Alma 24:5 has Alma and his brethren going to the land of Midian. This is the only occurrence of this Biblical name in a Book of Mormon New World setting. Verse 5 tells us that Midian was near the land of Ishmael. The critical text takes issue with the name "Midian," replacing it with the well-attested "Middoni" that was definitely close to Ishmael. Alma 53:22-23 says Helaman led his 2,000 stripling warriors into battle in the 28th year of the reign of the judges. Alma 56:9 says it was in the 26th year. They obviously can't both be right. There are other examples, but this short list should be enough to caution the alert reader. Texts have variants. Copyists make both inadvertent and intentional changes. Jesus Christ was the only infallible person who ever inhabited our small planet. Careful exegesis of The Book of Mormon benefits enormously from Royal Skousen's and his predecessors' meticulous work of textual criticism. FARMS published Robert F. Smith's 3-volume Critical Text of the Book of Mormon in the 1980's. One rabid anti-Mormon source immediately trumpeted in the media that FARMS, the quintessential defenders of the LDS canon, had come out with a text critical of the Book of Mormon. We quickly debunked that utter nonsense. A critical text is a work of supreme respect. Obviously, cities and lands were the dominant polities in the Nephite worldview after the abolition of the monarchy following Mosiah II. Cities seem straightforward enough in the text: urban settlements larger than villages or towns with surrounding agricultural areas Mosiah 23:25 or wilderness Alma 58:13. Lands are more complicated, particularly the key lands of Nephi and Zarahemla, which have different meanings in different contexts and at different times in Nephite history. In general, early uses of the term "land of Nephi" refer to the highland area immediately around the city of Nephi Alma 18:9 where Nephi I first settled 2 Nephi 5:8 after fleeing the coastal land of the Lehites' first inheritance. Many later uses of the term "land of Nephi" expand its meaning to include all the territory controlled by Lamanites Alma 58:38 south of the narrow strip of wilderness Alma 22:27 dividing line. In like manner, early uses of the term "land of Zarahemla" refer to the lowland area immediately around the city of Zarahemla Alma 5:1 where Mulek and his people first settled Mosiah 25:2 after making landfall north of the narrow neck Helaman 6:10, Alma 22:30. 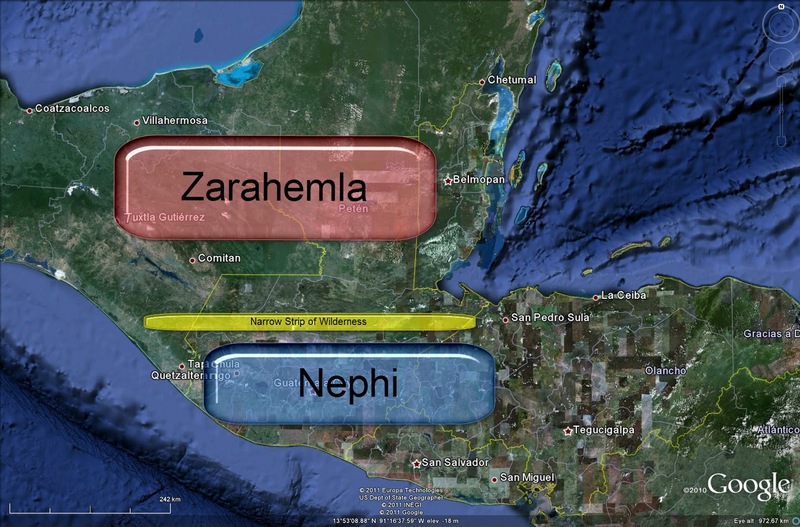 Many later uses of the term "land of Zarahemla" expand its meaning to include all the territory controlled by Nephites Alma 50:7 north of the narrow strip of wilderness dividing line and south and east of the land Bountiful. The blog article entitled "Zarahemla" explores five different meanings of the term in the text. during the early part of Nephite history. 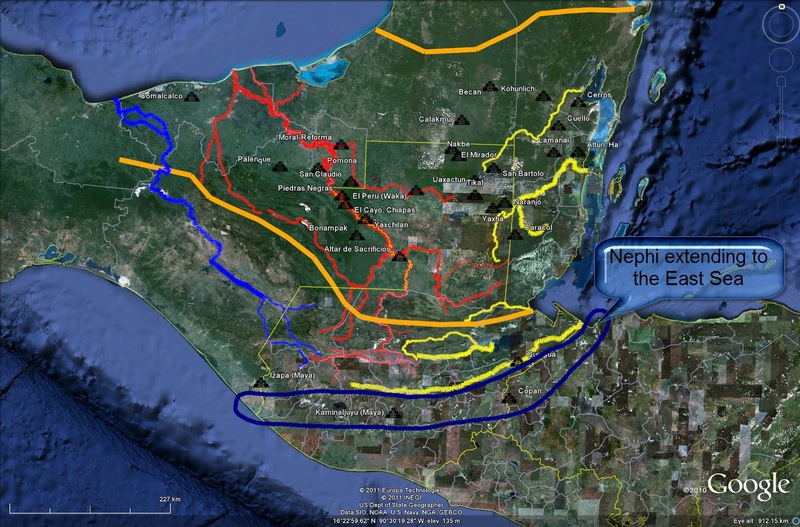 We expand the red and blue areas and add a yellow line to show the narrow strip of wilderness in an attempt to represent (approximately) the greater lands of Nephi and Zarahemla. the middle & later part of Nephite history. Together, the general (greater) lands of Nephi and Zarahamla constituted the land southward which was nearly surrounded by water Alma 22:32. We will let Google Earth help us visualize what Mormon may have meant by his comment "nearly surrounded by water." If this is indeed what Mormon had in mind in his mental map of the land southward, the perimeter outlined in red is 11.69% land and 88.31% salt water coastline. For an ever-evolving map reflecting some of the best current thinking about the location of the greater lands of Nephi and Zarahemla, see the blog article "Book of Mormon Map." The 8 days' journey from the Waters of Mormon to the Land of Helam were actual travel days stated as a measure of distance rather than elapsed time. Rest days (Sabbath observance) were probably not included in that number. The 1 day from the Land of Helam to the Valley of Alma was a very long, hard day. The 12 days in the wilderness from the Valley of Alma to the Land of Zarahemla were elapsed chronological days rather than travel days. Alma's group may have only traveled 10 or 11 days during that period. The 12-day number measured the distance to the southern borders of the Land of Zarahemla. The City of Zarahamla was not on this southern boundary, but lay some distance farther north. Helaman 1:18 for example, indicates that the great City Zarahemla was centrally located within Nephite lands. Many people, smitten with the surpassing splendor of Lake Atitlan (Guatemalans are fond of calling it "the most beautiful lake in the world"), have suggested it as an attractive candidate for the Waters of Mormon where Alma I preached and baptized. Following that suggestion, we have plotted 21 days' travel distances as concentric rings spaced 15 kilometers apart with the lovely town of Panajachel on the north shore of Lake Atitlan as the center point of the circles. 8 days to Helam in blue. 1 long day to the Valley of Alma in yellow. 12 days to the borders of the Land of Zarahemla in red. We established previously that the 200 kilometer long middle Usumacinta River is the place most likely to contain the remains of the city of Zarahemla (See the article "Water Fight on the River - Round Two" in this blog). 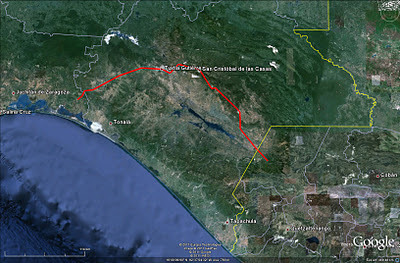 We overlay a representation of the middle Usumacinta on top of our map of Alma's travel days. our image of Alma I's likely travel distances. The Book of Mormon is true. It is a history by and about real people who lived and died in this land they knew intimately. When we finally do enough hard work and clear thinking to figure out the details of The Book of Mormon's New World setting, the pieces will fit together like a jigsaw puzzle. Even though we used Panajachel in this illustration of Alma's likely travel distances, neither it nor any other place around the shores of Lake Atitlan were the waters of Mormon. The text is quite clear that Alma's converts lived in the local lands of Nephi (Lehi-Nephi was a politically correct term for Nephi used only during the time of Zeniff's colony) and Shilom Mosiah 9:6 but gathered once a week Mosiah 18:25 on the Sabbath Mosiah 18:23 in Mormon Mosiah 18:30 which was near (in the borders of) Nephi and Shilom Mosiah 18:31. If Nephi was in highland Guatemala near modern-day Guatemala City as we believe it was, Lake Atitlan is much too far away (minimum 61 air kilometers or about 4 day's travel) to fit the text. This illustration with Lake Atitlan as the point of departure is intended to show one method of calculating Nephite travel distances based on the derived standard metric of 15 air kilometers per day. See a more refined presentation in point #24 of the blog article "The Usumacinta/Sidon Correlation." A viable candidate for the land of Helam is illustrated in the blog article "Helam." Many cultures throughout history have noted distance between two points as the time required to travel from one to the other. For example, In Washakie County, Wyoming, is the small town of Ten Sleep. The Sioux used to travel from Fort Laramie (not the much larger Laramie where the University of Wyoming is located) on the North Platte River to what is today Bridger, Montana. It took them 10 days or "sleeps" to reach a pleasant little valley at the confluence of two streams at the foot of the Big Horn Mountains. They called the place "Ten Sleep" and it carries that unusual name today. 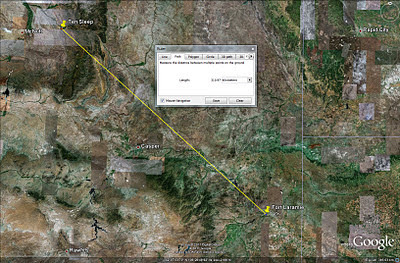 Plotting Fort Laramie and Ten Sleep in Google Earth, we see they are 310 air kilometers apart, which means the Sioux on this particular route averaged 31 air kilometers per day. Of course, their actual travel route was much longer as they made their way up, down, round about and over this rough terrain. Since we don't know exactly what path they traveled, we can't compute trail kilometers, but we can easily determine air kilometers as the distance between the beginning and ending points on this leg of their journey. Sioux route from the North Platte River to Ten Sleep, Wyoming. The fact that the Sioux routinely traveled 31 straight-line kilometers per day gives us a baseline with which to measure pre-industrial human activity in this part of the Rocky Mountains. The Spaniards who conquered Mexico and Central America also measured distance with time. The Spanish league (legua) was typically the distance a man could walk in one hour, about 4.2 kilometers or 2.6 miles. So, it is not particularly surprising that Nephites in The Book of Mormon recorded distances in number of days traveled. For instance, it took 8 days for Alma I and his converts to flee from the Waters of Mormon (actually, Alma's converts fled from their homes in the lands of Nephi and Shilom) to the Land of Helam Mosiah 23:3. How far would they have traveled in those 8 days? Relative distance questions such as this have fascinated curious Book of Mormon students for decades. Was a "day's journey" in Book of Mormon parlance Alma 8:6, Helaman 4:7 a standard unit of measure among the Nephites? Based on Alma 11:4 we believe the answer is yes. We have established that The Book of Mormon Land Southward is the area known today as southern Mexico and northern Central America. See the article "The Book of Mormon Map as of October, 2011" in this blog. We will now use Google Earth to plot actual distances from known pre-industrial journeys in our area of interest. These historical distances will help us establish a baseline with which to measure travel in Book of Mormon Mesoamerica. We start with a noted military expedition from the Teotihuacan empire that subjugated a number of southern lowland Maya city-states (for the approximate boundaries of the 3 Maya settlement regions, see the article "Water Fight on the River - Round Eighteen" in this blog) in 378 AD (close to the time Mormon and Moroni were leading the Nephites into their final great battle with the Lamanites in the Land of Cumorah). Our data is from the August, 2007 National Geographic article entitled "The Kingmaker" about the Teotihuacan influence that helped usher in the Maya classic era. From stela 31 at Tikal and other Mayan epigraphic sources, we know that the warlord, Fire is Born, with his military entourage entered Waka (modern El Peru) on January 8, 378 AD, and quickly took control of the city. He then recruited additional troops for his army and entered Tikal 8 days later on January 16, 378 AD. 378 AD military expedition from El Peru to Tikal in 8 days. This particular journey of conquest along the San Pedro River in Guatemala's central Peten covered 78 air kilometers in 8 days for a mean travel speed of 9.75 straight-line kilometers per day. The Post-classic Maya had lively commerce in both directions from the river port of Nito near the present-day city of Livingston, Guatemala, around the Yucatan Peninsula to the port of Xicalango on the Laguna de Terminos in present-day Tabasco, Mexico. Paddling near the coast in ocean-going canoes, Maya merchants carried vast quantities of trade goods. From Nito, there was also a southern coastal route that went up the San Juan River that forms the border between present-day Nicaragua and Costa Rica to trading ports on Lake Nicaragua. around Yucatan in 40 days. Maya traders with multiple oarsmen per vessel made this 1,600 kilometer trip in about 40 days, for a mean travel speed of 40 kilometers per day. In late Post-classic times, the Chontal Maya of Acalan in modern-day Campeche traveled up and down the Candelaria River to the major trading port of Xicalango on the western shores of the Laguna de Terminos. They could make the journey down the river to the lake in 1 day. On the return trip, it took them 3 days to go the same distance upriver against the current, negotiating rapids and falls. 1910-1938 time frame when he traveled extensively throughout southern Mesoamerican at the head of Carnegie Institution Expeditions. On canoe trips throughout Maya lands, Morley routinely traveled 9 - 10 kilometers per hour downstream and 3 kilometers per hour upstream. In 1525, Hernan Cortes led an army of 3,000 soldiers across present day Tabasco, Campeche, and Guatemala en route to Honduras to put down an insurrection. In one incredibly brutal march, this military force traveled from the Acalan capital of Itzamkanak (modern El Tigre) on the Candelaria River in Campeche to Lake Peten Itza in north central Guatemala in 5 very long days. through the Peten jungle in 5 days. In typical Spanish conquistador style, Cortes traveled with horses and armaments. He had native guides, rough maps, and advance groups of soldiers clearing the way, building crude bridges over wetlands, etc. This entire army (the majority of whom were native Americans) covered 160 air kilometers in 5 grueling days, for a mean travel speed of 32 straight-line kilometers per day. In 1586, Friar Alonso Ponce took a 10-day trip from San Juan Tiltepec near present-day Tonala, Chiapas, to Ayutla, Guatemala, just over the Suchiate River from the modern city of Ciudad Hidalgo, Mexico. coast to Ayutla, just over the Suchiate River in Guatemala. Father Ponce stopped many times along the way and still managed to cover the 243 point-to-point kilometers in 10 days for a mean travel speed of 24.3 point-to-point kilometers per day. Carlos Navarrete believed that without all the rest stops, this trip routinely took 4 or 5 days in Spanish Colonial times. To do this trip in 4 days would have meant a mean travel rate of 60.75 point-to-point kilometers per day. The more conservative 5 days would have resulted in a mean travel speed of 48.6 point-to- point kilometers per day. On September 3, 1586, Friar Alonso Ponce began a 13 day trip in the present-day town of San Antonio Huista in the Department of Huehuetenango, Guatemala. He traveled along the Spanish Camino Real with pack animals, stopping at Catholic Missions and private haciendas along the way. 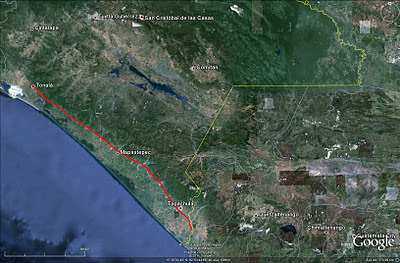 Waypoints included Coapa, Comitan, Amatenango, Teopisca, Ciudad Real de Chiapa (San Cristobal de las Casas), Zinacantan, Ixtapa, Chiapa de los Indios (Chiapa de Corzo), Tuxtla (Tuxtla Gutierrez), Ocozocoautla, Jiquipilas, and Macuilapa, before the journey ended near present-day San Pedro Tapantepec, Oaxaca. 1586 Spanish journey from Guatemala to Oaxaca in 13 days. Father Ponce covered 345 point-to-point air kilometers in 13 days, for a mean travel speed of 26.5 straight-line kilometers per day. He crossed many large rivers, dozens of smaller streams, and swampy wetlands. Some of the rivers were spanned by crude bridges. He also records very steep ascents and descents coming over the Sierra Madre Mountains. In 1695, the President of Guatemala, Don Jacinto de Barrios, captained an expedition to the Lacandons in their jungle fastness around Lacandon Lake. The Lacandons reported that they traveled to Coban regularly, and that it was an 8 - 10-day trip by land, or a 15-day trip going upriver in a canoe. 1695 Report of Lacandon Travels to Coban in 8 - 10 days. The Lacandons covered 141 air kilometers. If they made the trip in 8 days, their mean rate of travel was 17.6 straight-line kilometers per day. If they took the more conservative 10 days to make the trip, they traveled at the rate of 14.1 straight-line kilometers per day. In the latter half of the 1800's and the early part of the 1900's, generations of itinerant merchants from Mapastepec, Chiapas, traveled with pack trains to Chicomuselo, Tuxtla Gutierrez, Chiapa de Corzo, San Cristobal de las Casas, Amatenango del Valle, and finally Comitan, trading along the way. The trip was 450 trail kilometers or 357 air kilometers and they routinely covered that distance in 15 days. and on to Comitan in 15 days. 357 air kilometers in 15 days equates to a mean travel rate of 23.8 straight-line kilometers per day. Until the early 1900's, human tumpline porters carried merchandise throughout Guatemala. Ruth Bunzel, in her book Chichicastenango, a Guatemalan Village, Seattle: University of Washington Press, 1959, reports standard porter travel times between a number of cities, including Rabinal and Coban. A typical porter's burden in those days was 25 kilograms. Rabinal and Coban in the early 1900's in 3 days. From Rabinal to Coban, porters traveled 44 air kilometers in 3 days for a mean travel rate of 14.66 straight-line kilometers per day. The same porters traveled the gentler route from San Cristobal Verapaz through Coban to Cahabon in 4 days. in the early 1900's in 4 days. From San Cristobal Verapaz to Coban and then to Cahabon was 78 air kilometers. Porters making this trip in 4 days were moving at a mean travel rate of 19.5 straight-line kilometers per day. Heavily-laden petty merchants from Coban in the early part of the twentieth century used to travel from Cahabon, Guatemala, north east to San Pedro de Columbia, Belize in 16 days. These "Cobaneros" followed the Rio Sarstun for part of their journey and ended up on the southern flank of the Maya Mountains. The way point Chahal marked the boundary between the highlands to the south and the lowlands to the north. Cahabon to San Antonio Columbia in 16 days. The cargo-hauling merchants on this route covered 153 point to point air kilometers in 16 days, which means they moved at a mean travel rate of 9.56 straight line kilometers per day. In 1931, Sylvanus G. Morley led a Carnegie Institution Expedition to Yaxchilan. The team traveled up the Usumacinta River to Tenosique, then went overland with a pack train on a well-known trail west of the river. The course they followed was approximately where the Mexican Frontier Highway runs today. The trip took them 5 1/2 days. Tenosique to Yaxchilan in 5 1/2 days. This well-equipped archaeological expedition with horses and mules covered 151 point-to-point air miles in 5.5 days for a mean travel rate of 27.45 kilometers per day. Travel by dugout canoe upstream on a slow-moving river can be about as fast (3 kilometers per hour) as overland foot travel. Travel downstream in a canoe can be much faster than foot travel, depending of course on the swiftness of the current. In his numerous travels throughout Maya country, Sylvanus G. Morley often achieved downstream travel rates of 9 - 10 kilometers per hour. A heavily-laden canoe will travel slower than a lighter vessel carrying less gear and fewer supplies. A canoe with multiple paddlers will travel faster than a solo canoeist. On one trip, Morley traveled from Sayaxche on the Pasion River to Altar de Sacrificios at the confluence of the Pasion with the Salinas (the point where the Usumacinta begins). Morley covered these 80 river kilometers in 18 hours. Sayaxche to Altar de Sacrificios in 18 hours. 80 river kilometers in 18 hours equates to a mean river speed of 4.5 kilometers per hour. The air distance between Sayaxche and Altar de Sacrificios is 37 kilometers, so in this case Morley and his native boatmen managed 37 straight-line kilometers in 1 very long day day. In the early part of the 20th century, before paved roads and motorized transport were available in Alta Verapaz, people walked from Guatemala City to San Juan Chamelco (near Coban) in 4 days. San Juan Chamelco, Atla Verapaz in 4 days. 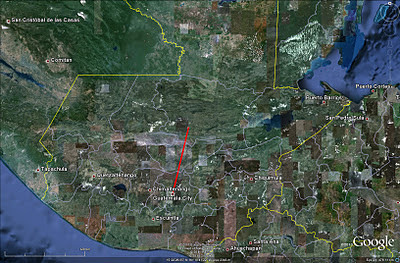 The air distance from Guatemala City to San Juan Chamelco is 93 kilometers. To cover this distance in 4 days, these Guatemalans were traveling at a mean rate of 23.25 straight-line kilometers per day. Based on known travel times from ethnographic sources, Richard E.W. Adams estimated that people in ancient Guatemala traveled on foot unladen from Coban to Sayaxche on the Pasion River in 8 days. Coban to Sayaxche on the Pasion Rier in 8 days. 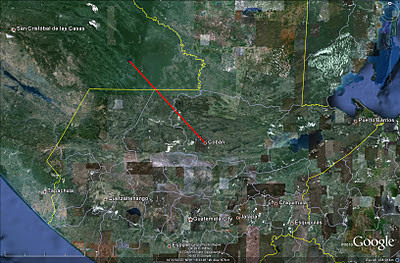 From Coban to Sayaxche is 119 air kilometers. To traverse this distance in 8 days, a person would travel at a mean rate of 14.875 straight-line kilometers per day. 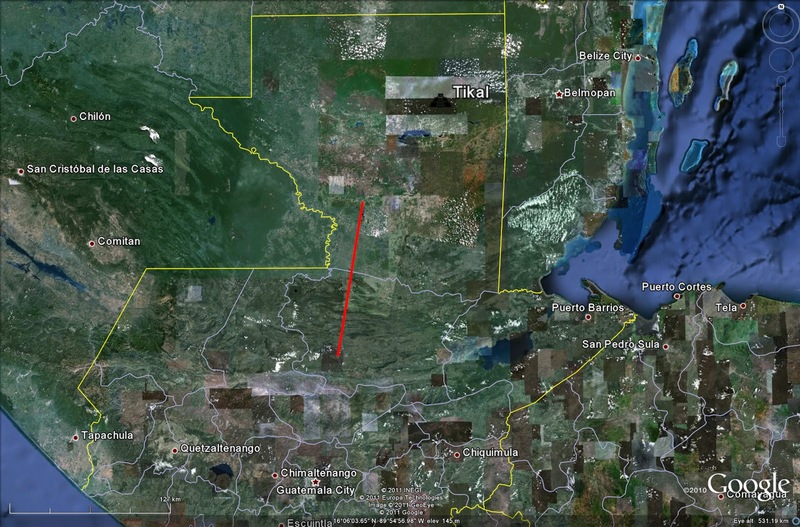 Some observers claim the natives traversed this route in 5 or 6 days. To travel 119 air kilometers in 5 days, a person would move at a mean rate of 23.8 straight-line kilometers per day. The 6-day trip would mean 19.83 kilometers per day. The same source estimated that people went from Sayaxche to Tikal in 3 - 4 days. Sayaxche to Tikal in 3 or 4 days. 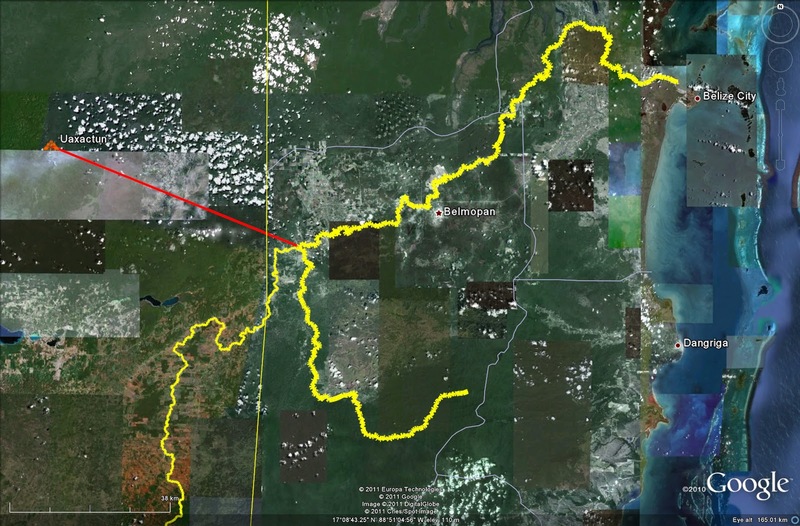 97 air kilometers separate Sayaxche from Tikal. In order to cover this distance in 3 days, a person would travel at the mean rate of 32.33 straight-line kilometers per day. To cover this distance in the more conservative 4 days, a person would move at the rate of 24.25 straight-line kilometers per day. Canoes from the coastal trade route around the Yucatan Peninsula could easily travel across Lake Izabal in eastern Guatemala and from there up the Polochic and Cahabon Rivers. One of these trading vessels went the 60 lake and river kilometers from El Estor to Cahaboncito in 2 days. and Cahabon Rivers to Cahaboncito in 2 days. This is a 60 kilometer trip across the lake and upstream on the rivers. Going 60 kilometers in 2 days is a mean travel rate of 30 kilometers per day which is very close to the 3 kilometer per hour estimate Sylvanus G. Morley calculated for travel upstream on a slow moving river. Since the air distance is only 24.85 kilometers, the straight-line travel speed was 12.425 kilometers per day. 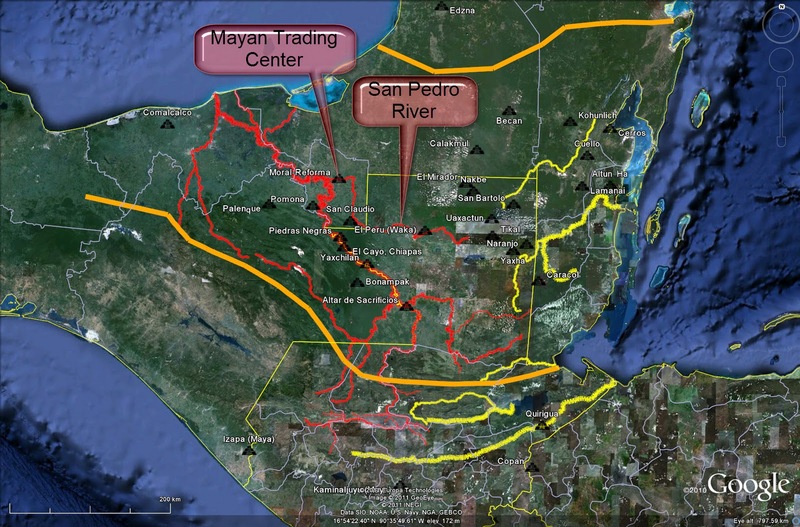 In order to reach the important Maya site of Uaxactun, an archaeological expedition traveled up the Belize River to the head of navigation at El Cayo (modern-day San Ignacio) and then went overland through the Peten jungle with pack trains. In 4 days they traveled 128 trail kilometers or 64 air kilometers. Human porters would have traversed this wild terrain much faster. to Uaxactun, Guatemala in 4 days. This expedition traveled 64 air kilometers in 4 days at a mean travel rate of 16 straight-line kilometers per day. There is a great deal more travel literature from this area we could mine for data, but we have 18 cases to analyze and that will allow us to draw some conclusions.This map shows the 18 known historical journeys we will use in our baseline data set. throughout southern Mesoamerica from 378 AD to the 1930's. 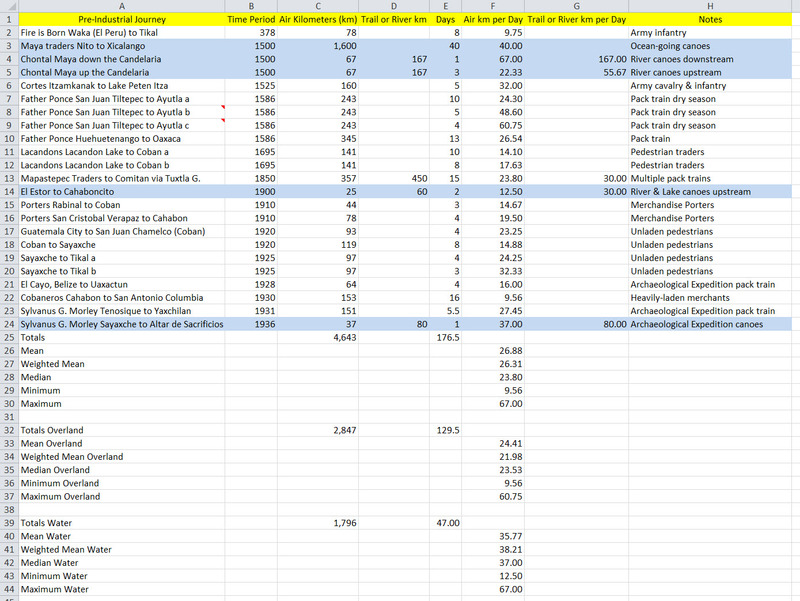 Plotting the data from these 18 journeys in a spreadsheet facilitates some calculations that will help us frame the discussion about Book of Mormon journeys in an appropriate context. The rows highlighted in blue were travels on water. The others were primarily overland. Click on the image to enlarge it to full-size (this works for any image in this blog). Many routes combined overland and river or lake travel. Travel on water was generally faster than travel overland. Small groups traveled faster than large groups. Humans traveled faster than pack animals. Humans travelling with animals often left drovers and herders behind with the animals while they went on ahead and arrived at the destination before their flocks and herds. Unladen pedestrians traveled faster than porters or heavily-laden merchants. 3 - 4 trail kilometers per hour was typical of unladen pedestrian travel in mountainous highlands or tropical lowland savannas. 2.5 - 3 trail kilometers per hour was typical of unladen pedestrian travel through dense jungle. 2.3 trail kilometers per hour was typical of Guatemalan tumpline porters carrying 25 kilogram (55 pound) burdens. Travel through mangrove swamps, quicksand, or muddy wetlands was very slow and difficult. It was only practical to travel along many routes in the dry season. Canoes were both paddled and poled (propelled forward by long poles pushed against the river bottom). 3 river-kilometers-per-hour was typical of canoe travel upstream on a slow-moving river. Canoe travel upstream was practically impossible on a fast-moving river. 4 - 10 river-kilometers-per-hour was typical of canoe travel downstream depending on water depth and current speed. River travel often required portages around rapids and falls. Heavily-laden canoes traveled slower than lighter craft, especially upstream. A canoe with multiple paddlers (or polers) traveled faster than the same canoe with a solo paddler. Some river crossings were spanned by simple rope bridges. 7 - 10 hours per day was a typical travel regimen for long trips. Grueling 10+ hour days were possible for short periods of time. Air (straight-line) kilometers are always shorter than trail or river kilometers. The sinuosity of the path determines the relative difference. A sinuosity factor of 1.4 or less is a relatively straight path. Taking all of the preceding into account, we can say with confidence that 10 air (straight-line) kilometers per day are on the low end of what we would reasonably expect from Book of Mormon journeys. 15 air kilometers per day are probably typical of Book of Mormon travels led by well-informed guides, and 20 air kilometers per day (or more) are not unreasonable. All bets are off, of course, when Book of Mormon groups are wandering around lost in the wilderness. 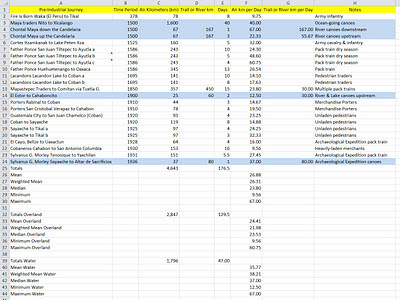 As an additional reality check, let's control our Book of Mormon travel rate numbers derived through inductive reasoning by comparing them with a series of well-documented, pre-industrial journeys - the 10 iconic Mormon Handcart Pioneer treks. The fastest trek averaged over 20 air kilometers per day, the slowest just under 14. The slowest trek was the ill-fated Martin company that suffered a 25% casualty rate en route. Yet another reality check comes from the well-documented march of the 5th Virginia Infantry Regiment who left from Camp Paxton, south of Fredericksburg, Virginia on June 4, 1863 and arrived in Gettysburg, Pennsylvania on July 1, 1863. This Civil War force of 345 fighting men plus their camp followers traveled 371 point-to-point air kilometers in 28 days for an average speed of 13.25 air kilometers per day. They fought 2 battles en route, the 2nd Battle of Winchester July 13 - 15, and the Battle of Stephenson's Depot July 15, 1863. 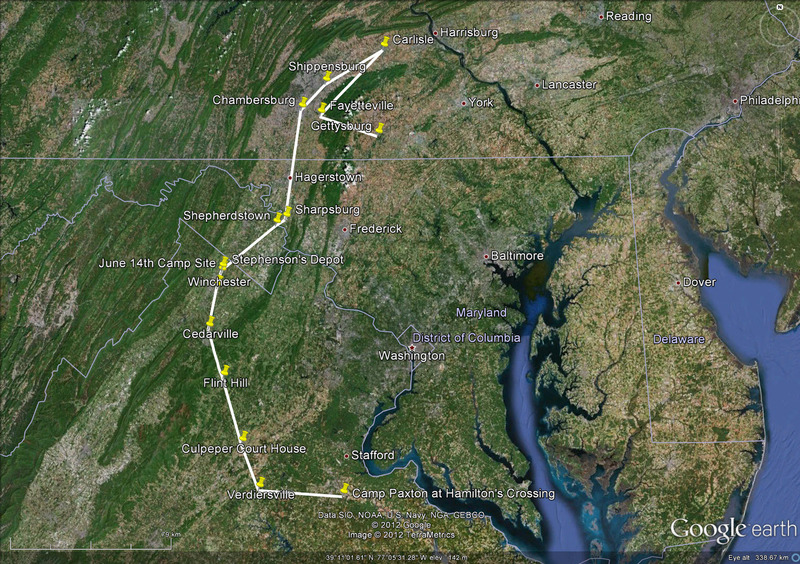 Their longest single day march was 54 air kilometers from Sharpsburg, Maryland to Chambersburg, Pennyslvania. After this extreme exertion, they rested for 2 days.They had 2 five-day rest stops en route, June 6th - 10th in Culpeper, Virginia and June 18th - 22nd in Sharpsburg, Maryland. They also had 1 four-day rest stop, June 26th - 29th in Carlisle, Pennsylvania. This was not a mad dash. The 5th Virginia was taking orders from General Robert E. Lee whose original objective was Harrisburg, capital of Pennsylvania, but who ended up massing the various elements of his Army of Northern Virginia at Gettysburg in what would become the largest battle ever fought (158,000 combatants) on North American soil in modern times. Our theorized Book of Mormon travel rate, 15 air (straight-line) kilometers per day, is right in the sweet spot of our various data sets, reasonable and defensible from any number of perspectives. 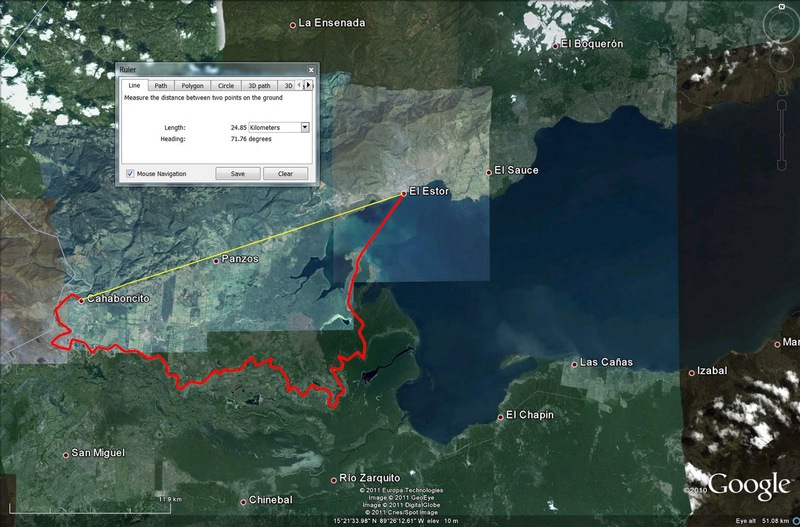 For additional validation, see the blog article "Benjamin Cluff Expedition Route & Distances." 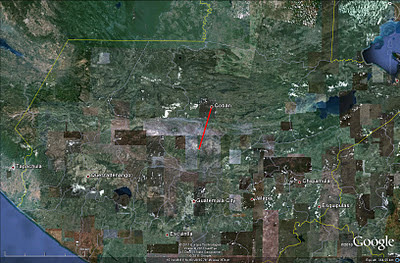 15 air kilometers is very close to the distance the precontact Rabinal in highland Guatemala called "one day's journey." See points 154 & 155 in the blog article "Rabinal Achi." 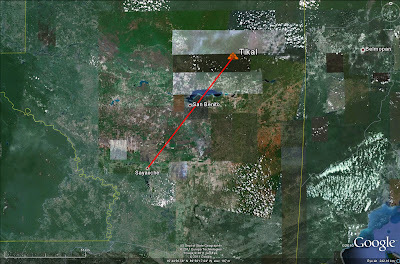 The blog article "Quichean Distance Measurement" brings together several data points that document the meaning of "one day's journey" (15 - 16 air kilometers) in the Quichean parlance of highland Guatemala. Richard Hansen describes El Mirador as 50 trail kilometers or 36 air kilometers from the nearest town, reachable via helicopter or on foot after walking for 3 days. This means contemporary archaeologists with pack animals in the northern Peten average about 12 air kilometers per day. See the article "Hansen and Coe." In their 2009 Ancient Mesoamerica article on polities entitled "States and Empires in Ancient Mesoamerica,"Arlen F. Chase, Diane Z. Chase, and Michael E. Smith conclude that Maya armies in march typically travelled about 20 air kilometers per day. An exceptional AD 659 journey in the Palenque area is documented in the article "Palenque." It supports our 15 air kilometers per day rule of thumb distance derivation. Similar support comes from an article entitled "The Raccoon Glyph in Classic Maya Writing" by Marc Zender in Pari Journal Vol. 5 No. 4 (2005). Zender reads a text from Lintel 2 of Tikal Temple IV as a description of an AD 744 attack by Tikal on Naranjo. 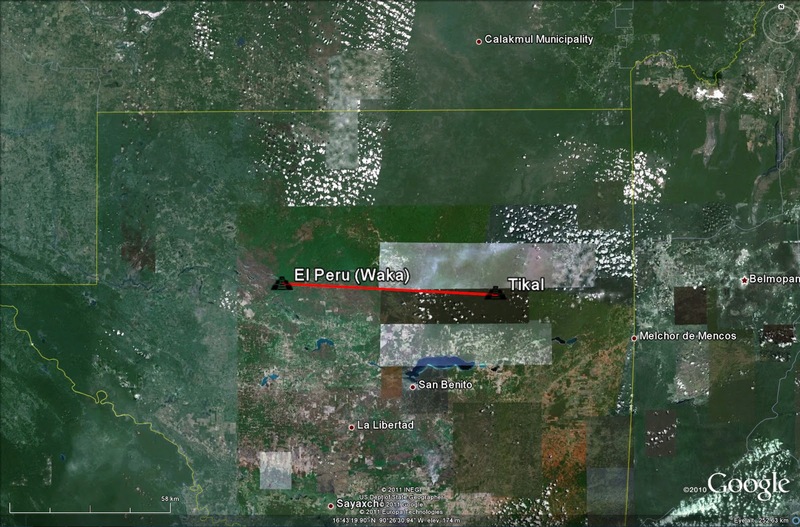 It took 2 days for the Tikal force to reach a staging point near Naranjo from which they launched a dawn raid. The distance from Tikal to Naranjo is 36 air kilometers. The staging point would have been slightly closer. This is yet another corroboration of our 15 - 16 air kilometers/day derived distance value. For an analysis of all instances of the Book of Mormon standard unit of distance measure, see the article "Test #6 Relative Distances." To download much of this data for your own analysis, see the blog article "Google Earth Downloads". Some may take the current work as a repudiation of John L. Sorenson. I see it as a continuation of John's pioneering insights. As Isaac Newton famously remarked in a 1676 letter to Robert Hooke: "If I have seen a little further, it is by standing on the shoulders of giants." When I returned from my mission to Peru a few days before Christmas, 1974, I had just spent 2 extra months in South America on a special research assignment from Elder Milton R. Hunter of the Seventy. I had visited museums, university professors and active archaeological digs. I had holed up for weeks in some of the best libraries in Lima and La Paz. In my returned missionary hubris, I thought I knew a thing or two about American pre-history. I visited my former Bishop, Orville C. Gunther, and told him about my travels and adventures. After recounting the story of John W. Welch's discovery of chiasmus in The Book of Mormon in Regensburg, Germany, on August 16, 1967 (Gunther was Welch's Mission President in the South German Mission), he suggested I visit John L. Sorenson who lived in a newly-built home just down the hill. In letters to me, my parents had mentioned this interesting new Sorenson fellow who had recently moved into our American Fork 14th Ward. I stopped by John's house on my way home and we visited for 2 hours. I left that day supremely humbled. What I knew about ancient America would fit in a thimble compared with Sorenson's vast command of the field. I have been a John L. Sorenson fan from that day to this. After decades of travel and research, I feel comfortable asking a few questions around the margins of his scholarship. In 1979, John and I were commiserating on the sad state of affairs in Book of Mormon studies. He asked me to investigate whether the Society for Early Historic Archaeology SEHA could be resurrected into a viable organization. After a couple of weeks, I returned and reported that I didn't think so - it was too fossilized, "studying its own navel" as C. Terry Warner would say. Sorenson and I determined that day to form a new organization. Literally within hours of that decision, someone told me that John W. (Jack) Welch had just created an organization in Los Angeles. I called my friend, Orville Gunther, who gave me Jack's home phone number and I called Welch that evening. Sure enough, Jack had just formed The Foundation for Ancient Research and Mormon Studies (FARMS) with his brother-in-law, Lew Cramer, and another LDS attorney, Clark Waddoups, who rode in their car pool. Furthermore, Jack would be in Provo soon to check out an offer he was considering to join the faculty of the J. Reuben Clark Law School at BYU. A short while later, I arranged a meeting at Delbert Palmer's spacious home in Provo. I picked up Jack at his hotel and drove him to the gathering. With about 20 other Book of Mormon scholars and aficionados present, John L. Sorenson met John W. Welch for the first time and the modern era of Book of Mormon studies began. When Jack brought the legal structure of FARMS with him to Provo in 1980, it wasn't long before it developed into an effective organization. In 1984, it was finally time for Deseret Book and FARMS to publish John L. Sorenson's much anticipated manuscript on The Book of Mormon in ancient Mesoamerica. John was not sure what to do about the maps in his path-breaking book. I checked out the facilities at BYU and the University of Utah and we decided to contract with the U Cartography Lab. I took John up to Salt Lake to meet with them several times and when An Ancient American Setting for the Book of Mormon was published in 1985, almost everyone (including Hugh W. Nibley) liked the maps. I had accompanied Jack and John on the 1984 FARMS expedition to Mesoamerica (John chose the itinerary, Joseph L. Allen led the tour, and the evening lectures were from John Sorenson and Jack Welch. There may never be another Book of Mormon lands tour to equal it.) and John included some of my photography from that trip in his book. In 2009, I was privileged to introduce John L. Sorenson and his wife, Helen, as they received the Father Lehi and Mother Sariah awards from The Book of Mormon Archaeological Forum at the 7th Annual Book of Mormon Lands Conference in Salt Lake City. (John's first wife, Kathryn, passed away in 1991.) In my introduction, I acknowledged my great intellectual debt to Dr. Sorenson. He taught me to think critically about the people and events moving in their places through the pages of The Book of Mormon. I have also been privileged to live near V. Garth Norman most of my adult life. We have been on several Mesoamerican adventures together. He has guided me through the remarkable astronomical alignments at the Parowan Gap. He has personally escorted me through the impressive layout of the Izapa temple complex. But, most of all, I have spent hundreds of hours with him in his study poring over details of The Book of Mormon text and nuances of ancient Mesoamerican culture. For decades, I discounted Garth's scholarship because he held no university post, was not widely published, and some of his Book of Mormon conclusions ran counter to John L. Sorenson's better known ideas. Elsewhere in this blog, I told the story of my 2006 epiphany moment in the National Museum of Anthropology in Mexico City. See the article "Book of Mormon Lands 1986 - 2011." After that experience with Garth, I reminisced on our long association. Had he ever led me astray? No. Had he ever been sloppy in his scholarship? No. Was he bold and sometimes iconoclastic? Yes. I decided to give his Book of Mormon geographical correlation ideas the benefit of the doubt. Five years later, this analysis of the Usumacinta/Sidon correlation is one result of that decision. A great deal of what I know about The Book of Mormon in Mesoamerica I learned from Garth Norman. Larry L. Poulsen shared with me his passion for using geographical information system GIS technology to help solve Book of Mormon map problems. His pioneering use of Google Earth and an early predecessor (DeLorme) inspired me to develop some expertise with this essential tool. Ted D. Stoddard prodded me on several occasions to write something rather than just verbally pontificating. His most recent encouragement was in August, 2011, and even though I am serving as an LDS Bishop which is rather time-consuming, I came to the conclusion that Ted was right, and I went into authoring mode that very month. It has now been established to many people's satisfaction that the Sidon in The Book of Mormon is the Usumacinta River in Central America. See the article "The River Sidon - Precis" in this blog. See also the article entitled "The Usumacinta/Sidon Correlation". So, it is time to slightly re-draw the current Book of Mormon map. We previously published a consensus map dated September, 2011 that reflects the best thinking of most Book of Mormon scholars. See the article "The Book of Mormon Map as of September, 2011 in this blog. It is premature to update that consensus. Like unity in any organization, consensus takes time and only time will tell whether the Usumacinta/Sidon correlation that seems so compelling now to many proves clear and convincing to most Book of Mormon scholars. In the mean time, we are prepared to publish a best fit Book of Mormon map. We believe we have amply demonstrated that the Usumacinta River best fits the criteria specified in The Book of Mormon text. to show the Usumacinta as the Sidon. The Mezcalapa-Grijalva versus Usumacinta debate has polarized Book of Mormon scholars since the early 1950's when Thomas Stuart Ferguson, Gareth W. Lowe, and John L. Sorenson began exploring the former while M. Wells Jakeman and Ross T. Christensen were still focused on the latter. This impasse has impeded progress in the New World geography sub-discipline within Book of Mormon studies for decades. The consensus Book of Mormon map was at approximately the same point in September, 2011, as it was in 1973 when David A. Palmer contacted a small band of scholars and began circulating papers and reviews to determine which of the two rivers was the more viable candidate for Sidon. Hopefully, the analysis in this blog will help move that discussion forward. Thirty-eight years is long enough to wander in the wilderness. It is time to finally settle The Book of Mormon into its Promised Land. Note: The following dated material was edited on November 5, 2011. On Saturday, November 5th, 2011, the 9th Annual Book of Mormon Lands Conference sponsored by the Book of Mormon Archaeological Forum (BMAF) was held at the Sheraton Hotel in downtown Salt Lake City. The afternoon session was devoted to the Mezcalapa-Grijalva versus Usumacinta question. Larry Poulsen and Ted Stoddard advocated for the Mezcalapa-Grijalva. Jerry Ainsworth and Joe Anderson advocated for the Usumacinta. Joe Allen (who earlier in the day with his wife, Rhoda, received the Father Lehi and Mother Sariah lifetime achievement awards) and I (Kirk Magleby) joined the panel discussion afterward. Some thought-provoking material was presented, portions of which will be addressed in future posts to this blog. See the blog article entitled "Book of Mormon Map" for an ever-evolving map reflecting some of the best current thinking about The Book of Mormon New World geographic correlation. We began our investigation of the River Sidon in The Book of Mormon by recommending several scholars whose disciplined work over decades warrants careful consideration. Hugh W. Nibley, John W. Welch, John L. Sorenson, and V. Garth Norman were highlighted as bold, source-critical students of the Nephite text. See the article "Book of Mormon Scholars" in this blog. Our purpose was to acknowledge a standard of excellence that should pervade serious Book of Mormon research. Much of what has passed for Book of Mormon scholarship in the LDS community is not academically defensible because it lacks rigor, depth, and breadth. I will recount one telling example. While a student at BYU in the mid 1970's, I worked as Dr. Paul R. Cheesman's research assistant. He was a retired construction executive from Florida who returned to BYU mid-life and earned his doctorate in Religious Education in 1967. In his former career, Dr. Cheesman had worked extensively throughout the Americas and acquired a noteworthy collection of ancient artifacts. He was an indefatigable traveler, keen observer, and excellent photographer. He published several books on the history of The Book of Mormon and possible New World archaeological correlations. Metal plates, Mesoamerican wheeled toys and evidences of ancient transoceanic contact were some of his particular interests. As an entrepreneur, he was one of the founding fathers of the thriving publishing industry that interprets The Book of Mormon for LDS children in illustrated picture books and cartoon videos. As a scholar, though, he was not credible outside the myopic, incestuous little world of so-called "Book of Mormon Archaeology." He once returned from a trip to the University of Florida where he had been invited to speak, and as he entered the office, he was visibly upset. The LDS Institute in Gainesville had set up the event, billed at first as a lecture on "The Book of Mormon and Ancient American Archaeology." At the last minute, under pressure from the University, the organizers were forced to drop The Book of Mormon from the agenda and Dr. Cheesman was asked to give his lecture simply on "Ancient American Archaeology." He was devastated. "I may be one of the world's experts on Book of Mormon archaeology" he complained, "but I don't have much to say about archaeology by itself." We next guided the reader on a whirlwind tour of Book of Mormon geographical thought from the time of Joseph Smith to the publication of John L.Sorenson's landmark An Ancient American Setting for The Book of Mormon, Salt Lake City: Deseret Book & FARMS, 1985. See the article "Book of Mormon Lands 1830 - 1985" in this blog. For a much more detailed look at this curious atlas of theories, see John L. Sorenson, The Geography of Book of Mormon Events: A Source Book, Provo: FARMS, 1992, as well as the unpublished work of Alan C. Miner on a history of thought about Book of Mormon Geography. We introduced The Foundation for Ancient Research and Mormon Studies (FARMS) that set the standard for solid Book of Mormon work for decades after its founding in 1979. As the year 1985 ended, Mesoamerica was The Book of Mormon's ancient New World setting. There were two candidates for the River Sidon: the Grijalva and the Usumacinta, and the winds of LDS scholarship were blowing toward the Grijalva. Many serious students of Mormonism's defining text were looking for ancient Zarahamla in the central depression of Chiapas. In the years following 1985, the data have increasingly favored the Usumacinta. See the article "Book of Mormon Lands 1986 - 2011" in this blog. We discussed the gradual decline of FARMS after it officially became part of BYU in 1997 and highlighted the important but little known work of V. Garth Norman. Some students of The Book of Mormon, lacking an unambiguous sense of time and place in the text, conclude that physical externalities are unimportant, even pejorative to their spiritual testimonies of the scriptural record. In the article "Why Do We Care?" in this blog, we explain that studying The Book of Mormon in its cultural, chronological and spatial contexts adds depth and meaning to our understanding and helps us share its divine message with the world. We then recap the general consensus about Book of Mormon lands that has existed since the 1970's in the LDS scholarly community. See the article "The Book of Mormon Map as of September, 2011" in this blog. We list some of the leading individuals and institutions that form this consensus. With some background established, we are then ready to take an in-depth look at two very large rivers. We clarify nomenclature by explaining that modern maps of Guatemala, Chiapas, and Tabasco show the Grijalva after the 1675 Spanish colonial diversion that re-routed the river just below Cardenas, Tabasco. 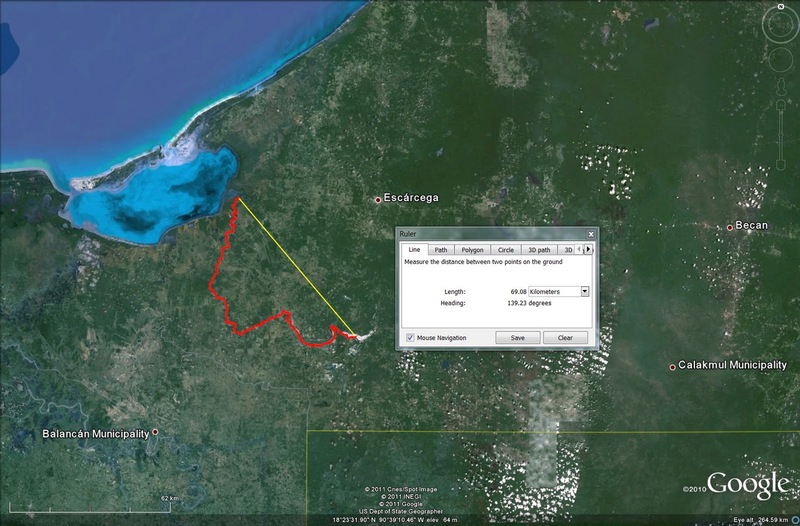 We show that the lower Grijalva has flowed in a number of different channels over the years from the Tonala River on the west to the current mouth of the combined Grijalva/Usumacinta at Frontera, Tabasco, today. See the article "Wandering River" in this blog. We explain why the name "Grijalva" is confusing and give rationale for using the more accurate "Mezcalapa-Grijalva" when referring to the river that flows through the central depression of Chiapas and El Sumidero Canyon. We conclude with a map of the Mezcalapa-Grijalva and the Usumacinta rivers in their drainage basins as they flowed at the time the Mulekites founded their capital, Zarahemla. Using Google Earth, we will overlay a number of spatial data sets on top of this map to compare and contrast various characteristics of the two river systems. We illustrate how different the Mezcalapa-Grijalva and the Usumacinta are by comparing 17 different physical and cultural characteristics of each river. See the article "Sizing up the Candidates" in this blog. We then get to the heart of the matter by asking 18 probing questions about communities and events in The Book of Mormon and their relationships to each other and to their Mesoamerican setting. The 18 questions are documented with 84 scriptural passages hyperlinked to the lds.org electronic version of the text. See the article "Asking the Right Questions" in this blog. It is our belief that if we have asked the right questions, the answers will indicate whether the Mezcalapa-Grijalva or the Usumacinta is The Book of Mormon's River Sidon in a powerful, clear and convincing way. An old German proverb says "Gute Frage ist halbe Antwort," "a good question is half an answer." John E. Clark in his excellent article "Revisiting A Key for Evaluating Nephite Geographies" Mormon Studies Review (Formerly FARMS Review) 23:1, 2011 argues that any attempt at spatial correlation must begin with a thorough exegesis of the text. Our 18 questions are precisely that kind of in-depth analysis of what The Book of Mormon does and does not say. Before we answer the 18 questions, we describe and illustrate the nomenclature standards hydrologists, geographers and archaeologists use when they refer to the Mezcalapa-Grijalva and the Usumacinta. Each river divides into upper, middle, and lower sections. See the article "Dividing the Rivers" in this blog. Each river also has a rate of fall or slope gradient, which we calculate. The Book of Mormon uses the term "wilderness" over 200 times. With 27 scriptural references hyperlinked to the lds.org electronic version of the text, we show that some wildernesses were heavily populated, while others had few inhabitants. Some wildernesses were clearly mountainous, while others were obviously in the lowlands. See the article "A Note about Wilderness" in this blog. 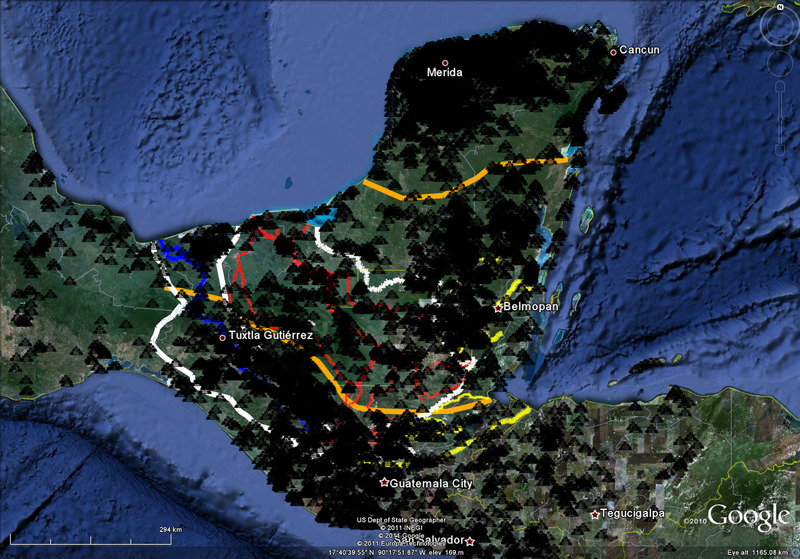 We then introduce the fundamentally important Electronic Atlas of Ancient Maya Sites (EAAMS). This data base of 6,000+ known archaeological sites from pre-Hispanic southern Mesoamerica is a project closely affiliated with the Middle American Research Institute (MARI) at Tulane. Over more than a dozen years, many Mesoamericanists led by two MARI Research Fellows have geo-coded and compiled source references for sites documented in mainstream Mesoamerican and particularly Mayan archaeological literature. This gold mine of geographical information system GIS data allows us to easily work with an unprecedented number of ancient sites as overlays on top of Google Earth base maps. We will use EAAMS data to control the presence or absence of potential wilderness areas in specific geographies of interest. See the 18 articles in order from "Water Fight on the River - Round One" to "Water Fight on the River - Round Eighteen" in this blog. After analyzing 18 questions, answers, exhibits, and conclusions, the running score is Mezcalapa-Grijalva 0, Usumacinta 18. We declare unequivocally our belief that Mesoamerica is the site of the New World events described in The Book of Mormon, and that the River Sidon mentioned 37 times in the Nephite text is the Usumacinta River system in Guatemala; and Chiapas and Tabasco, Mexico. 18. Question. 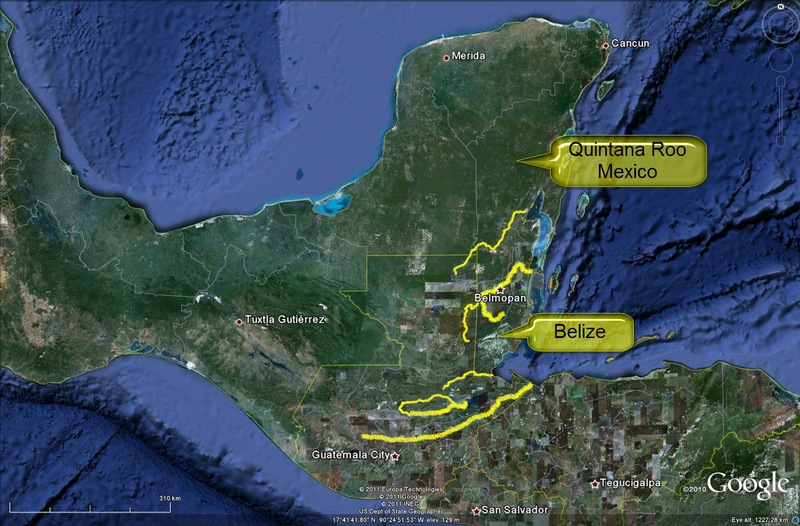 Were the territories in modern-day Belize and Quintana Roo part of The Book of Mormon picture? See the article "Asking the Right Questions" in this blog. 18. Answer. Yes. Most of the New World events described in The Book of Mormon happened in the Land Southward. 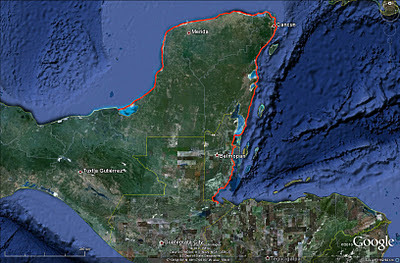 The Caribbean coastal areas of Quintana Roo and Belize were important during Jaredite (Olmec and Epi-Olmec), Nephite-Mulekite (Izapan and Maya pre-classic), and Lamanite (Maya pre-classic, classic and post-classic) times. Rio Motagua that runs for 437 kilometers across most of Guatemala and forms the border between Guatemala on the north and Honduras on the south at its extreme eastern end. 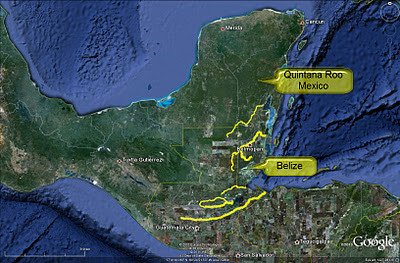 through Quintana Roo, Belize, and Guatemala. We then overlay EAAMS data on top of a zoomed in view of this Caribbean coast. Hundreds of important sites were located anciently in the eastern Mesoamerican areas of Quintana Roo and Belize. 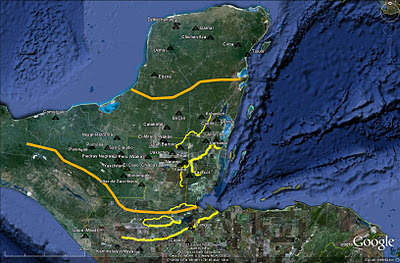 Note for example the heavy concentration of sites where the Rio Mopan joins the Belize River just upstream from Belmopan. Mayanists recognize three major settlement regions - the highland Maya in the south, the southern lowland Maya in the middle, and the northern lowland Maya in Yucatan. Orange lines on the map below represent the approximate boundaries of these three regions. The white lines show the Mezcalapa-Grijalva and Usumacinta drainage basins. The Mezcalapa-Grijalva River system is in blue. The Usumacinta River system is in red. 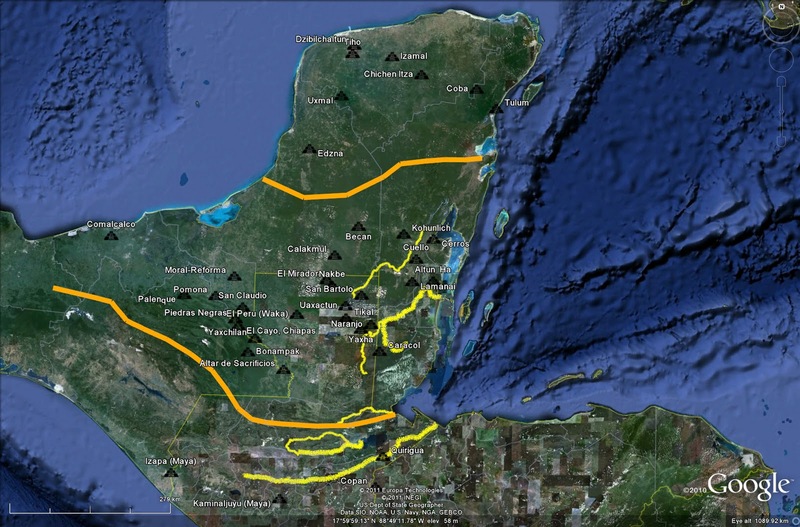 The eastward-flowing rivers that drain into the Caribbean are in yellow. Known archaeological sites are in black. This is the most cluttered map we have yet shown, but remember what we said at the beginning of our river trip: solving The Book of Mormon map puzzle requires best fit analysis. It is a multivariate calculus problem rather than a simple a + b = c equation. 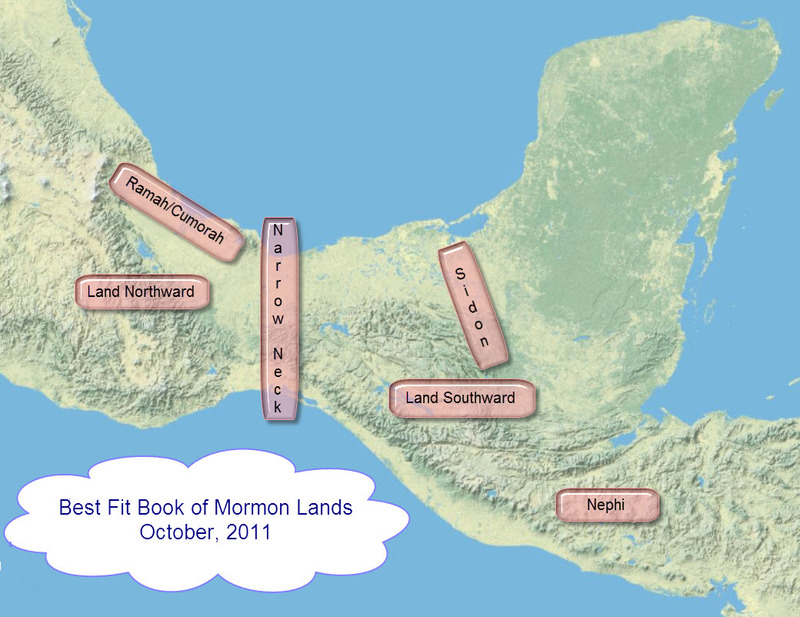 See the article "The Book of Mormon Map as of September, 2011" in this blog. We must control multiple data sets simultaneously in 3 dimensions to accurately model what was going on with millions of people across millenia on an extraordinarily diverse landscape. Google Earth is our essential tool. 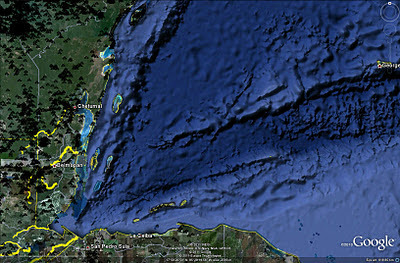 in the middle, and the Northern Lowland Maya in Yucatan. Some of the largest, most important and best known Maya sites are shown below within the highland, southern lowland, and northern lowland regions. Some of the most noteworthy Maya sites. 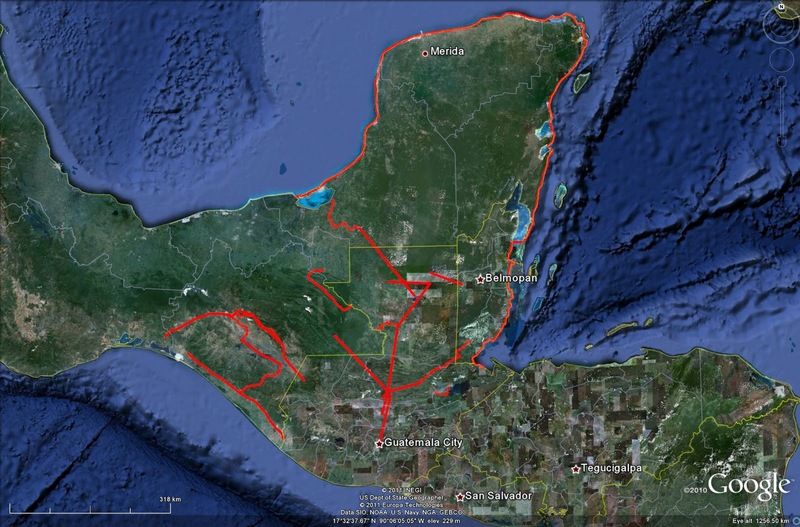 The southern lowland Maya sites, including those in Quintana Roo and Belize, formed a cultural continuum. They shared many common traits including language, architecture, belief systems, land use patterns, etc. This is largely explained by topography. Rivers, as major communication and transportation arteries, facilitated contact, trade, and conquest. 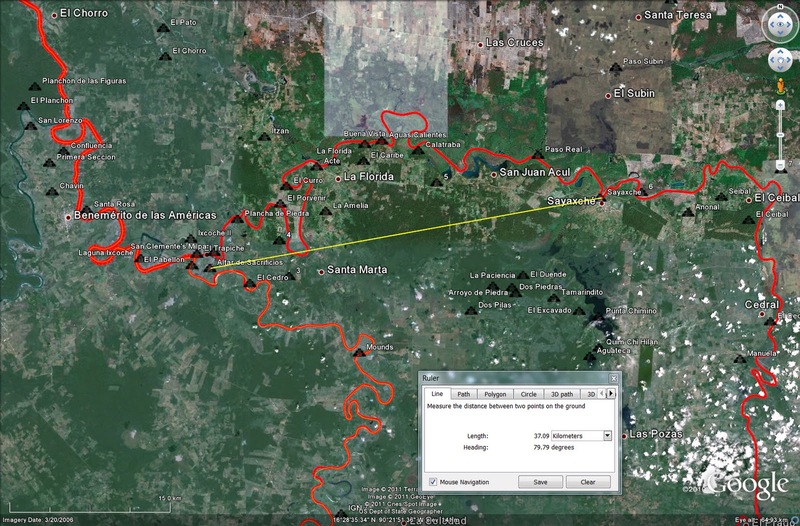 Note how the San Pedro River provides a direct route from the Usumacinta into the Tikal, Uaxactun area in the Peten. 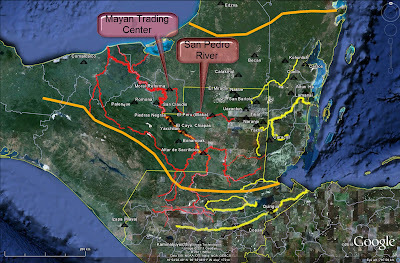 That explains why the site of Moral-Reforma at the confluence of the San Pedro with the Usumacinta was a major Mayan trading center. 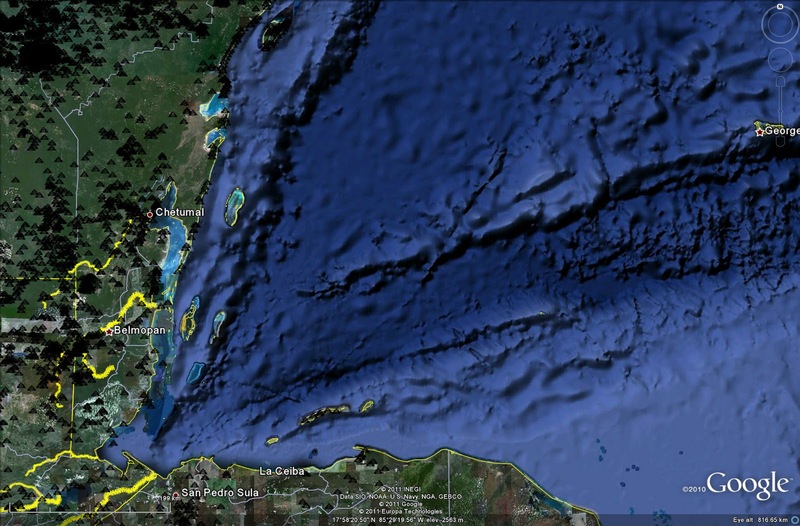 Sea-borne trade also went from the Caribbean coast around the top of the Yucatan Peninsula to another major Mayan trading center at Xicalango (Aguacatal) near Ciudad del Carmen in the Laguna de Terminos. interlinked avenues of communication and trade. 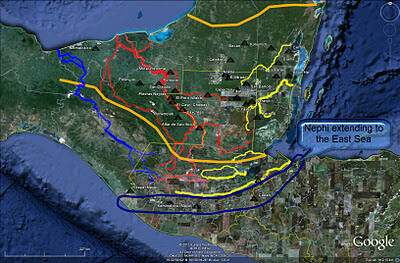 The Mezcalapa-Grijalva River system, on the contrary, was remote from the rivers and sites along the Caribbean coast. The Book of Mormon clearly states that the Land of Nephi extended from the west to the East Sea, which must be the Caribbean Alma 22:27, Alma 50:8. Lamanite lands extending from the west to the East Sea. If the Caribbean is the East Sea of the Lamanites, it follows that it is also the East Sea of the Nephites Alma 50:9, Helaman 3:8, Helaman 11:20. 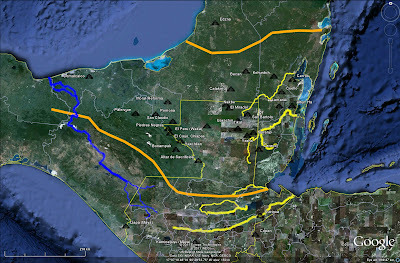 Notice there are no important Maya sites along the Mezcalapa-Grijalva River on the previous map. The Mezcalapa-Grijalva was home to many sites, but most of them, particularly in Book of Mormon times, were Zoque (or to a much smaller degree, Zapotec) rather than Maya. This image from BYU faculty member Bruce R. Bachand's excellent article "Chiapa de Corzo: Rise of a Zoque Capital in the Heart of Mesoamerica," in Popular Archaeology, Vol. 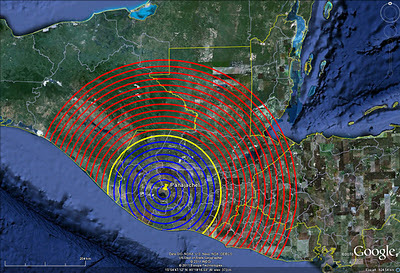 3, June 2011 shows the Mixe-Zoque (Olmec) region of influence during early formative (Jaredite) times in green. It also shows the later Zoque area of influence centered on Chiapa de Corzo during middle formative (late Jaredite, early Nephite-Mulekite) times in red. After 400 BC, Zoque territory receded as the Maya moved westward and supplanted them throughout the Usumacinta River basin and the Guatemalan highlands. 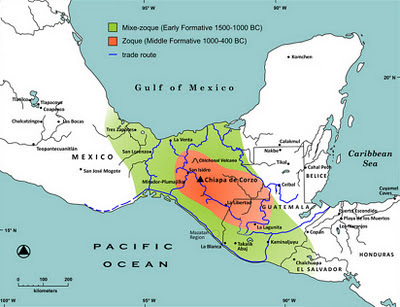 Mixe-Zoque and Zoque areas prior to 400 BC. Mayan encroachment from 400 BC to the European Conquest limited the earlier Zoque to the Mezcalapa-Grijalva River basin as this map of the approximate Native American language distributions in 1500 AD shows. Mayan Language Distribution ca 1500 AD. 18. Conclusion. The Caribbean coastal areas of Quintana Roo and Belize were integral parts of the southern lowland Maya culture core, linked to important Mayan sites throughout the Usumacinta River basin. The Usumacinta from Book of Mormon times to the Spanish Conquest was a Mayan river. The Mezcalapa-Grijalva, on the other hand, was generally a Zoque river during and after The Book of Mormon era. The Book of Mormon East Sea lands along the Caribbean were linked topographically and culturally with the Usumacinta. They were remote, both geographically and linguistically, from the distant Mezcalapa-Grijalva. 18. Running Score. Mezcalapa-Grijalva 0. Usumacinta 18.